On the surface, selling on Amazon is a straightforward process. You ship your goods to Amazon’s warehouse. Amazon pays you money based on what you sold. Sounds simple right? But as with any online business, there’s a lot more going on under the hood that most people won’t tell you about. Now if you only have 1 or 2 products for sale, managing your Amazon account is easy. But after you start selling over 5 products, things can start to get complicated UNLESS you use the right tools to monitor your account. Right now, we sell over 480 SKUs in our online store but only 20 or so items on Amazon. And even at 20 products, it’s painful to manually check up on each product on a regular basis. Here’s how we manage our account. First off, if you sell more than 5 products, you should invest in an account monitoring tool. At a bare minimum, you need to know when someone leaves negative product feedback or negative seller feedback so you can take action immediately. Without account monitoring software, you’d be forced to check on your products manually on a regular basis. But any more than that and you’ll either go crazy or let things slip through the cracks. 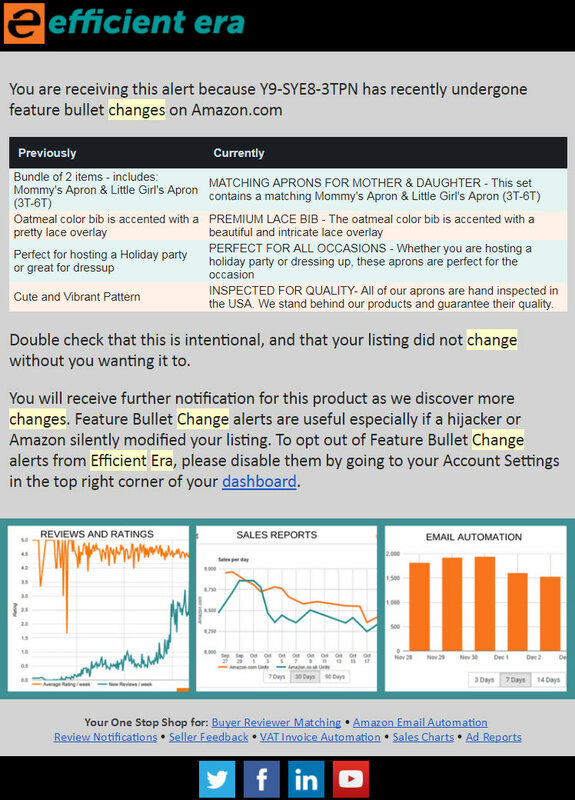 Right now, I’m using a tool called Efficient Era to send me automatic Amazon alerts so I’ll be using examples throughout this post. 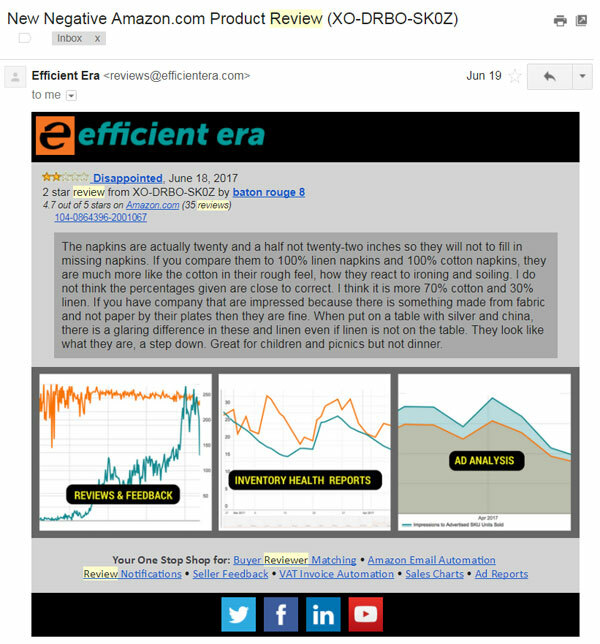 Editor’s Note: Efficient Era is so inexpensive that it makes it a no brainer to sign up. You basically get charged 8 cents per product and 1 cent per transaction per month. For example, if you have a single product that sells 300 units per month, you’d get charged only $3! For small accounts, you can use them practically for FREE. Seriously, it’s a NO BRAINER! 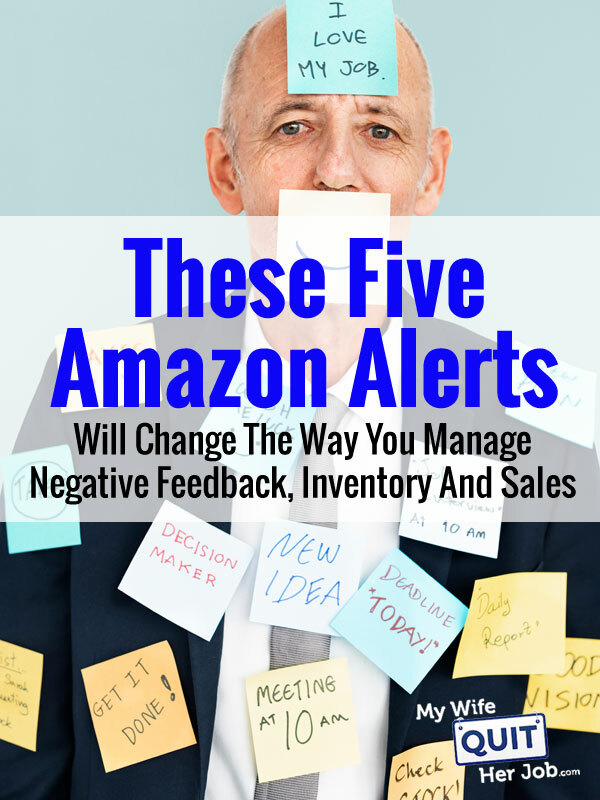 Managing customer feedback is crucial when growing an Amazon business. You need to know whenever someone leaves a review on ANY product whether it’s positive or negative. Right now, I have Efficient Era set up to send me an email whenever anyone leaves me a review for BOTH products and seller feedback. Here’s what a negative feedback email alert looks like. Of these emails, I filter out “negative reviews” into a separate folder and pay specific attention to reviews that are 2 or lower. Whenever I see a negative review in my inbox, I take action IMMEDIATELY. First I login to the dashboard and spot the review. Then I click on the “order” button which takes me directly to the customer who purchased the item. Note: Efficient Era is the ONLY tool that I’ve used so far that does buyer review matching and it’s 99% accurate. This alone makes it worth it. From here, I usually contact the customer and try to make things right. In rare cases, I’m able to turn a bad review into a good one and I make sure that the customer does not leave angry. Sometimes customers accidentally leave negative product reviews as seller feedback. These reviews can be easily removed by contacting Amazon directly. 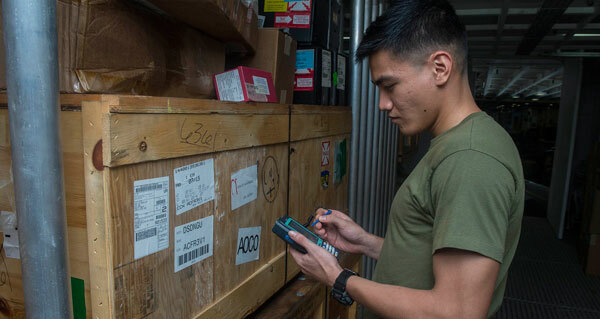 Similar to managing your feedback, maintaining your inventory in Amazon’s warehouse is easy if you only have a few items for sale. But once you get beyond 5 products, things get problematic. 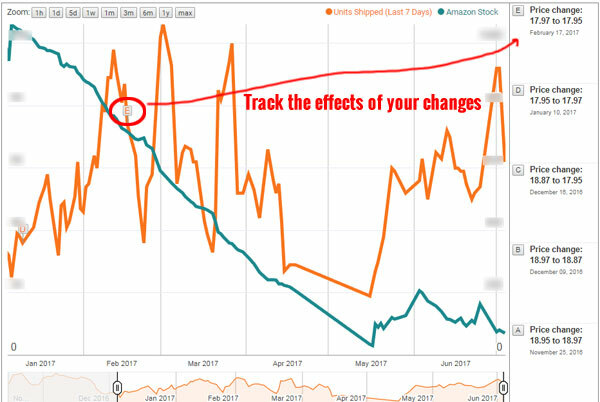 Sometimes a big surge of business can put you out of stock and you need to be aware of any anomalies in your Amazon sales. How do I monitor these anomalies? First off, I get email alerts whenever a product has reached a new shipment threshold. 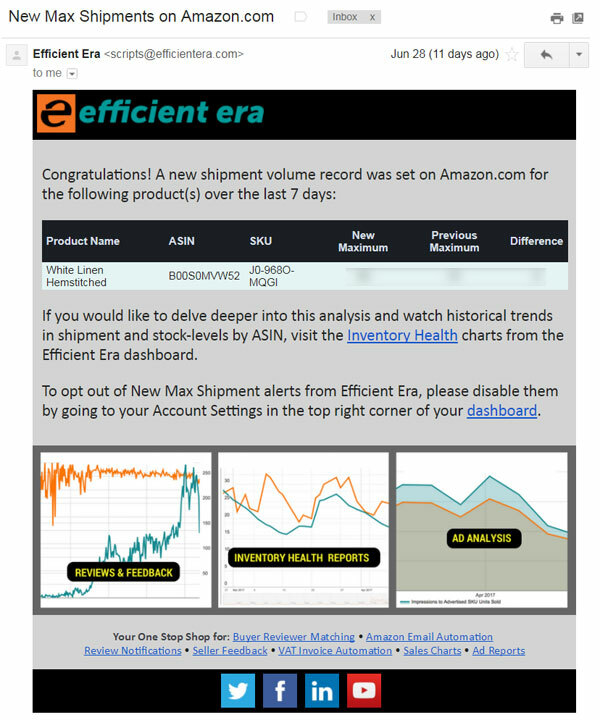 Whenever I get one of these emails, I check my inventory status for that item in Efficient Era. In the graph above, the green line is my inventory level and the orange line is my sales. By taking a quick look at the green line, I can determine graphically whether I need to send more product to Amazon. One other thing that is cool about this graph is that any changes to your pricing and listing is clearly marked so you can easily track the effects of your changes on sales. In the example above, I changed my pricing during the periods marked by “D” and “E”. In addition to unusual surges in sales, I also get email alerts that tell me when inventory is low so I can replenish my stock in a timely manner. If you’ve followed my blog for any length of time, you are probably aware that we generate a lot of our business through B2B sales. In general, businesses tend to buy products in larger quantities so you need to keep an eye out for these types of customers. 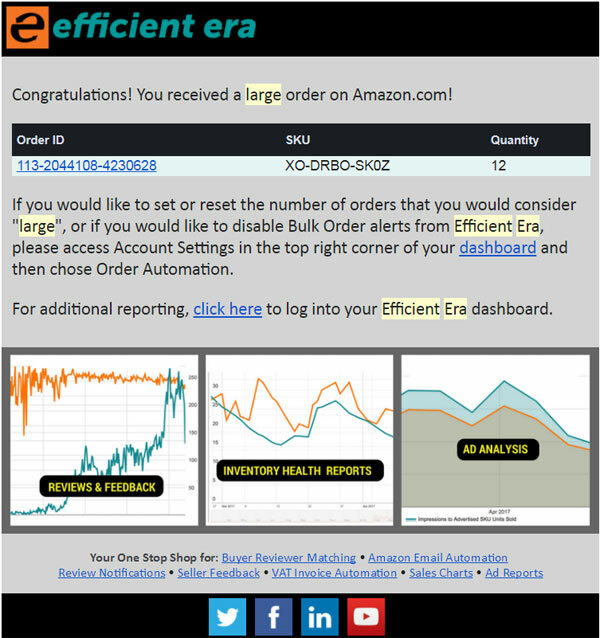 Whenever we receive a large order on Amazon, Efficient Era sends me an email. Wow. This person purchased 12 dozen napkins….Hmm…Could this be an event planner? Perhaps we should reach out and send them a coupon or contact them by voice. One of the unfortunate aspects of selling on Amazon is having to deal with hijackers. And if things weren’t bad enough, sometimes Amazon will randomly change the bullet points in your listing WITHOUT your permission. In fact, I’ve been noticing mysterious listing alterations more and more in the past year. As a result, I have Efficient Era send me an email whenever anything changes at all with my listing. As a result, I know immediately when anyone has hopped on my listing and whenever any verbiage changes. Recently, I wrote a very comprehensive post on how to run profitable Amazon sponsored ad campaigns. But one thing that I forgot to mention in that post is a nifty graph I found in Efficient Era that helps you monitor your keyword performance. First off, reading this graph is NOT very intuitive so let me define a few things first. 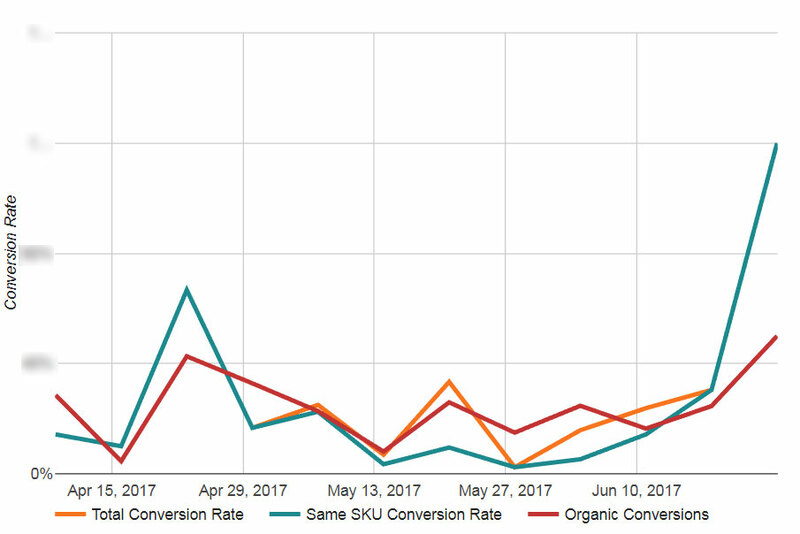 If you are running your Amazon ad campaigns effectively, your PPC conversion rate for your keywords should be on par with your organic keyword conversion rate. It’s because you have full control over your Amazon PPC keywords whereas you have less control over what you rank for on organic Amazon search. If your paid keywords are doing worse than your organic keywords, then that means that you are probably not bidding on the right terms. Find out your high converting organic keywords and bid more on them – Use a tool like Scope to find out what your competitors are ranking for. Just because you have a lot of products for sale on Amazon doesn’t mean that you need to hire a large team. 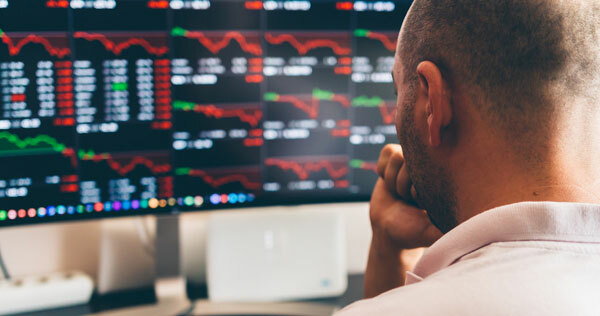 By leveraging alert based tools like Efficient Era, you can drastically cut down on the amount of time you spend monitoring your listings manually. Normally, I don’t flat out recommend signing up for any tool because there’s usually a tradeoff between cost and functionality. But in the case of Efficient Era, the tool is so inexpensive that it seriously is a no brainer. If you have very little sales on Amazon, it’s practically free. If you sell in large volume, then the tool is still cheaper than 90% of the tools out there. If anything, the buyer review matching feature makes it worth it on it’s own!